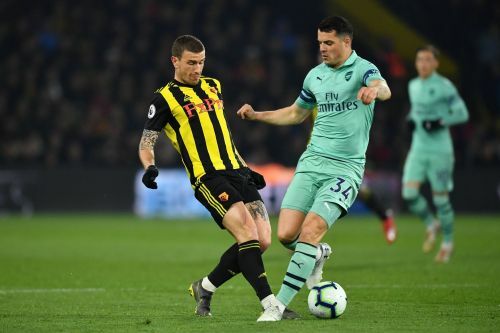 North London giants Arsenal made the trip to Vicarage Road on Monday evening to face off against Watford, in the top flight of English football. The Gunners needed a win to build momentum in the race to finish in the top four of the Premier League, with Tottenham, Manchester United and Chelsea all closely involved in the race as well. With that being said, the north London giants started off this away fixture on a really positive note. It was a matter of 75 seconds of madness which saw the home side throw the game away and eventually they just could not recover to get something out of it. 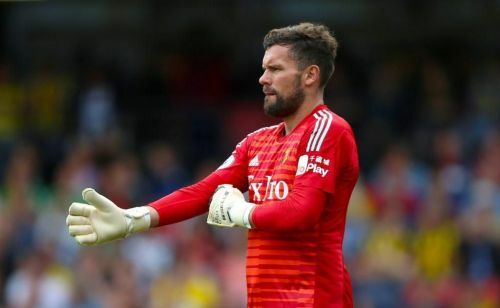 Ben Foster made a comical error when he fooled around with a back-pass in the 10th minute of the game, only for Aubameyang to press hard and get the better of him. The eventual result was a goal for the visitors giving them the advantage in the match. On the other hand, Troy Deeney was sent off a minute later for a silly challenge on Lucas Torreira, as it seemed that he had elbowed the Uruguayan international. This changed the whole dynamic of the match, with the hosts having to rethink their strategy. However, a very poor performance by the Londoners helped the home side, as they dominated most of the game, only to end up short and lose it 1-0. Arsenal failed to capitalize on the chances that they got and it ended in a narrow win for them, with the Gabon international’s goal eventually being the winner of the match. The only goal of the game was the result of a comical error made by the Watford keeper, in a situation that he could have totally avoided. Foster overplayed in the “danger-area” and paid the price for it, as Aubameyang did not give him time on the ball and kept running around. It was the attacker’s hard-work paying off against a moment of madness for the English goalie, which eventually cost the hosts. Foster will surely want to forget this blunder of his.